The world has changed and so have I. I don’t do things the same as the generations that came before me and I’m proud of it! I know what I want, and that is to remain independent. I want to age my way, in my own place. I’ve always faced life head on and will keep doing it that way. I live life according to my rules. What does the future look like? It looks the way I want it to look! Bottom line? Life is full of experiences, and I’m going to experience life on my terms! 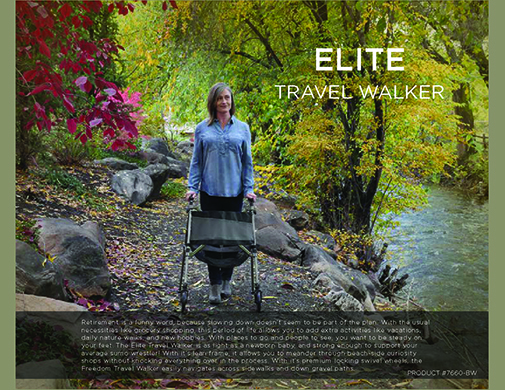 This small, portable walker is designed to be the perfect companion for your next adventure. It's fold-able, light-weight structure makes it easy to stash in an overhead airplane compartment or in the front seat of your car, while large swivel wheels allow you to maneuver through a variety of terrain. HELPFUL TIP: you can go literally anywhere you want to go because it can fit in the overhead compartment of the airplane, in the front seat of the car, or even in the shopping cart so you can have it right with you while you are grabbing your groceries. 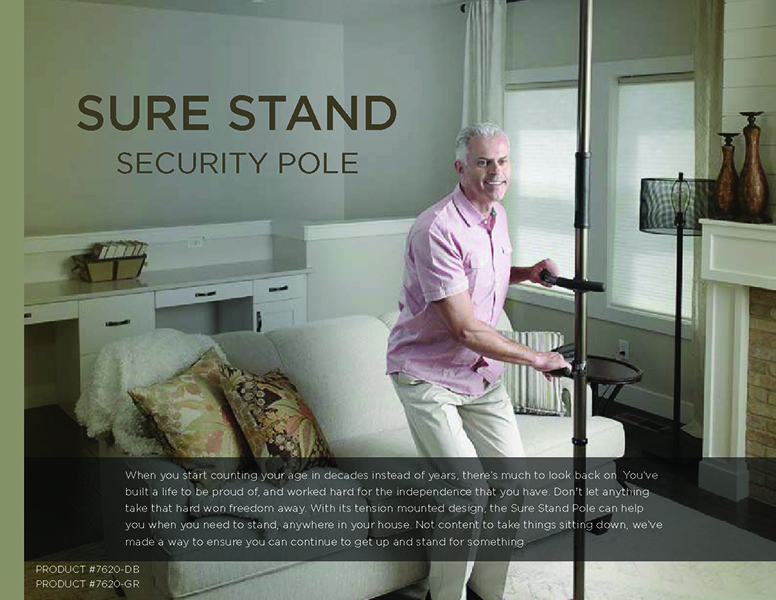 You love the comforting feeling of your home, and now, with the Sure Stand Pole, you can have the support you need to stand safely without changing the look and feel of your home. The Sure Stand pole is tension mounted, so it can be installed anywhere in the home without drilling holes in your floor or ceiling. HELPFUL TIP: The most common place in the home for falls is in the bathroom, so place the Sure Stand Pole between the tub/shower and toilet, then position the handles to be used for both getting in and out of the shower, and on and off the toilet. Your bedroom is your sanctuary. It’s where you go to escape, relax, and recharge. Now, you can have the support you need, with a discrete bedside handle. 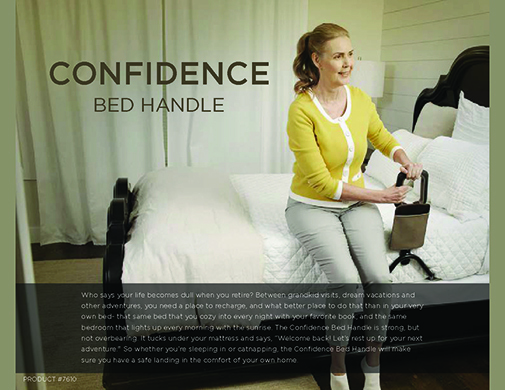 The Confidence Bed Handle from Signature Life offers extra stability so you can stand with confidence and peace of mind. 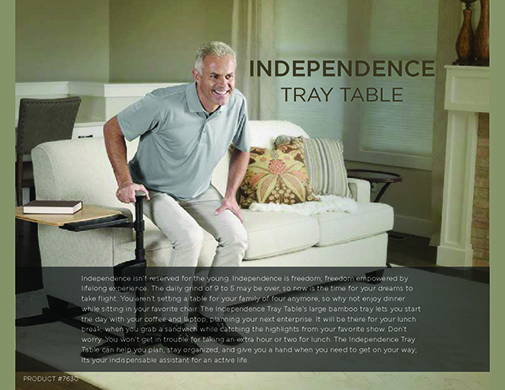 Unlike other TV Trays, the Independence Tray swivels around 360˚, so you can slide it out of the way without ANY risk of spilling. It blends in with your Living Room like another piece of furniture to keep the familiar feeling of your home. HELPFUL TIP: After sitting for long periods of time, many people are effectd by dizziness and even weakness. Use the Independence Tray Table with your favorite chair or lift chair to provide extra stability and support while standing. 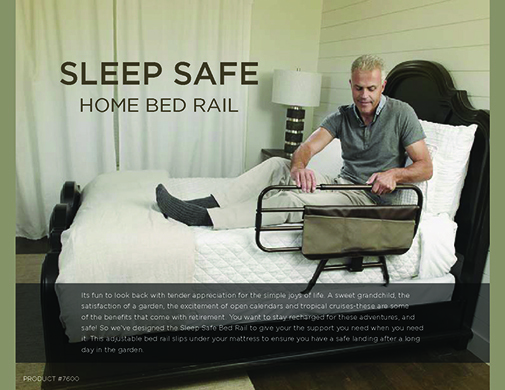 HELPFUL TIP: Anyone that uses a cane, walker, or rollator can benefit from using a bed rail. Whether you need to use the bathroom in the middle of the night, or just need a helping hand to stand, the Confidence Bed Handle is discrete, yet provides that extra support you need. 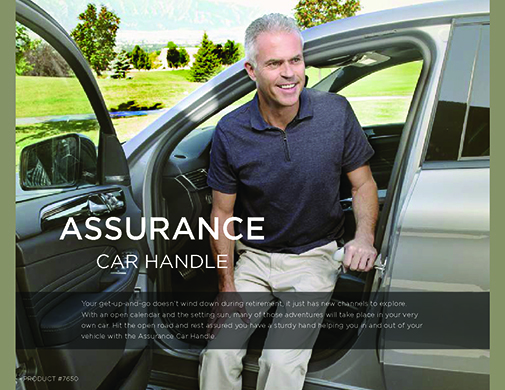 With the Assurance Car Handle from Signature Life, you can relax knowing that you have the support you need, and the freedom to travel with confidence. If you have trouble getting in and out of your car, the Assurance Car Handle is for you! It slides into the striker of any car door, and places the handle right where you need it for maximum support. Create your own path with the Assurance Car Handle.